Day 2 – What’s for Dinner? Isn’t it interesting how when you start out on a journey, there are many hands to guide you along the way? Yesterday, my son and I purchased Blackberry Torches. Yes, I now have a Blackberry – and those lost moments sitting at a hockey rink wishing there was something to do are now gone forever! Anyway, I digress. I found an incredible app for the Blackberry (and various other SmartPhones) called Food Network Canada. It’s absolutely terrific. There are many recipes available there for you to try and videos to help you along the way. There are so many tools to support us on our quest for good food. If that wasn’t enough, I read a blog post this morning (and yes, on my Blackberry) from Sandi Krakowski about What the Secret Millionaire Should Have Bought at the Grocery Store. What Sandi was pointing out was that if people feel that they cannot afford food, they have a tendency to not eat it. Instead they eat packaged junk food – that’s an impoverished mind set for not only are you feeding your body garbage, but you’re telling your body that it is a garbage can worthy only of receiving garbage. 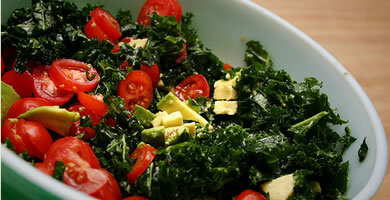 Instead, she offers a very inexpensive weekly ‘diet’ for one person that includes no junk food. She recognizes that when your eat food in order to nourish your body, all aspects of your life are nourished and prosper. OK – so now what’s cooking for dinner? 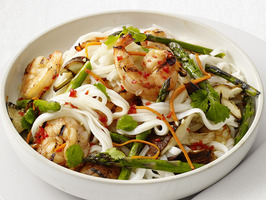 Food Network made a shrimp noodle bowl (see picture above) for dinner today, but we can’t eat shrimp here because Mark is allergic to shellfish. But I was planning on making a fish noodle bowl anyway, and I’ll switch a white fish for the shrimp. Here’s the recipe from Food Network with a few of my tweaks. Meanwhile, whisk the lime juice, fish sauce, maple syrup, garlic, chili sauce and 1/3 cup vegetable stock in a medium bowl. Transfer 1/4 cup of the marinade to another bowl and toss with the fish. Toss another 1/4 cup marinade with the vegetables. Let the fish and vegetables marinate 10 minutes at room temperature. Heat a heavy saucepan (this is when I pull out my Le Creuset pot – I love this pot) to medium-high. Grill the fish, peppers and mushrooms until the fish is just cooked through, 2 to 3 minutes. Add 2 cups of vegetable stock and bring to boil. Once it comes to a boil, add the bok chok – turn off the heat and cover. Divide the noodles among bowls and top with the fish soup. Delicious! It was really delicious and everyone ate it, even my teenage son ate the broccoli. Who knew that was possible? But I forgot to add the bean sprouts, so there wasn’t tons to go around – which is why they’re going in the noodle bowl tonight. I had a great weekend escape last weekend with 5 friends from high school. While it was wonderful to talk about when we were in high school and catch up on who’s doing what, what I found to be the most powerful was how we are going through similar things together. Because I love food, everyone had lots of questions about food and healing, food and cancer, food and psychology. It made me realize that everyone is starting to be more knowledgeable about how food affects our bodies and how society’s search for easy, fast food, is actually starting to hurt us – not only from a physical stand point, but also from a family and community place. I’m thinking of doing another month-long experiment. Each day I’ll write about what I’m making for supper. That way not only do I become accountable, but also it makes me really walk my talk. And you’ll be able to recognize that I have the same challenges as most of you. I have a teenage son who won’t eat vegetables (but will eat fruit and so he has a Greens + supplement with every meal), a husband who is so busy with work that we sometimes aren’t able to eat together (and he often forgets to eat), and a daughter who is always watching her weight and so juggles what food is put in front of her. Me, I prefer to eat vegetables, but will enjoy white meat and fish. Oh, and cheese. I LUV cheese! Tonight we’re having a Thai Basil Turkey dish, with saffron rice (white basmati rice), and stir fried vegetables. No doubt my son will pick out all of the vegetables and green things – but I’ll get over it! I found the recipe idea in the Longo’s magazine on the inside front cover ad for Maple Leaf chicken. I’m using free-range turkey from the butcher instead. Add onions, garlic and peppers. Cook until onions are softened. Add basil and hoisin sauce, cook for 2-3 minutes (I’m also marinating the turkey right now in hoisin mixed with veggie stock). Serve with rice and stir-fried vegetables (I’m doing bean sprouts, snow peas, broccoli, carrots, cauliflower, red pepper and red onion). I look forward to your comments. Let me know what you’re cooking for dinner – it may help me decide what’s on for Thursday dinner! I’ve just hired a business coach and I couldn’t be happier with my decision. We all know the saying that what you put your focus on expands. When you focus on nourishing your body, then your whole life becomes nourished. I’ve chosen to put my focus on my business right now (I’m always focussed on food first though!). So much of my life has been spent running around, doing things because “they need to be done” or someone has asked me to do them. It’s my turn now to finally focus on what I want and need to be looking at in order for my business to develop, and grow. 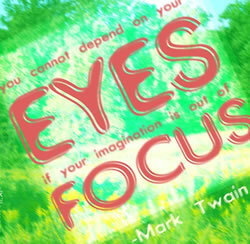 Focus is something that I often have difficulty with. I’m interested in so many different things and have a tendency to follow my passions wherever they take me. The result has been a life filled with variety, with interesting experiences and wonderful people I’ve met along the way. I cannot complain. But I often feel like I’m busy going nowhere. With Joanne Burgess (of Virtually Yours), I feel like I will have a mentor who can now show me the way to pull all of that passion and vitality in my life and turn it around so that it can benefit my clients. I have so much knowledge and experience to share and she will help me to package it in such as way as to reach the people who can really use it. Isn’t it amazing how the teacher always appears when the student is ready? Just watched this great overview video of the history of Fossil Fuels, combined with a look into the potential future of clean energy. It’s very well done and informative. My teenage daughter is absolutely appalled that I would even consider writing about this, but I have to let you in on an experiment that I’ve been doing. I have always had large breasts, and have always worn very supportive underwire bras. I put it on first thing in the morning and take it off last thing at night. And my breasts have always hurt – sore, heavy and uncomfortable – especially around the time of my period. After completing the Healthy Breast program I decided that I was going to try something different. For one month, I would spend time going braless. On days when I’m not going anywhere, I decided to spend the day braless. When going out, I bound up the girls and went on my way, but when I returned home I let them out for some air! And you know what, they really feel great! They don’t hurt constantly anymore. I don’t have the soreness under my arms that I now realized was caused by a blocked lymphatic drainage system. I just finished a period during which my breasts did not hurt! I never realized how much that has affected me all my life. So I urge every one of you to take off your bras whenever you can and let the body’s natural drainage systems work without any constrictions or blockages. The first couple of days are a little uncomfortable, but after that your breasts will feel much better. This is my favourite colour! This week, I found this Box of Crayons and I love the way this man (Michael Bungay Stanier) thinks, writes and share. His email today was all about status and how we are constantly judging ourselves in relation to others – even when we don’t want to be. I/Thou is when you truly see and connect with the person before you, see them as full and complete in themselves. It’s a moment, when you see and acknowledge the very best of the person before you. It’s a terribly difficult thing to do. It requires you to listen. You need be aware of and manage your own fears, biases and judgments.